With 27 books in three languages (English, French, and Farsi) spread over three decades, you’d think philosopher and academic Ramin Jahanbegloo would be blasé about the imminent publication of his next written work. 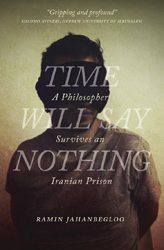 But there’s more than a hint of anxiety about Time Will Say Nothing: A Philosopher Survives an Iranian Prison. Coming this fall from University of Regina Press, the book is Jahanbegloo’s first foray into personal narrative, a reliving of an encounter with oppression that made international headlines in 2006. “This was the most difficult book I had to write in my life,” says the 57-year-old author during an interview in downtown Toronto, where he lives with his wife and nine-year-old daughter. 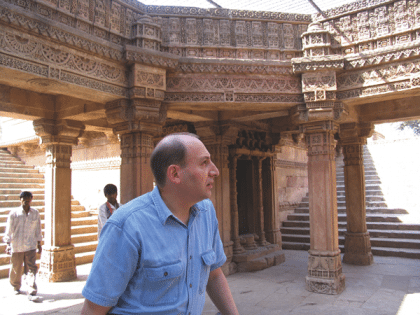 His plain white T-shirt and fading blue jeans lend him an ultra-casual look, a far cry from the image he cultivates as an international public intellectual. But nothing in his story should be taken lightly. Time Will Say Nothing starts in April 2006 when the Iranian-Canadian author was arrested at Mehrabad airport in Tehran and detained in solitary confinement for more than four months at Iran’s notorious Evin Prison, accused of plotting to overthrow the Islamic Republic in a “velvet revolution.” Contrary to the title, borrowed from a W.H. Auden poem, the passage of time since his ordeal does say something – about Jahanbegloo, his home country, and his adopted one. The writing began during his imprisonment, with a series of aphorisms that made their way into the final book. Writing, he explains, was an act of survival and a way of combating the physical effects of fear. While memoirs of jail time in Iran are becoming an identifiable subgenre of prison literature – Marina Nemat’s Prisoner of Tehran and Then They Came for Me by Maziar Bahari (with Aimee Molloy) come to mind – Jahanbegloo’s book doubles as a philosophical treatise on two themes that have occupied much of his intellectual life: nonviolence and the value of intercultural dialogue. Time Will Say Nothing certainly qualifies as deep, intense reading. It’s packed with details about Jahanbegloo’s prison experience, his life and loves, and a thoroughgoing analysis of the various strands of Iranian culture (Islamic, Western, Persian). Booksellers can shelve it under memoir, philosophy, or modern history, at least until they stumble on its final chapter, in which Jahanbegloo lashes out at Canada, with a disdainful nod to Toronto’s “dispassionate people and tasteless food.” Canada – where he failed to replicate the intellectual prestige bestowed on him elsewhere in the world, or even get a tenured position at a university – is multicultural but not intercultural. People from various backgrounds come here as immigrants but rarely get to know each other beyond the surface level of food or cultural festivals, he argues. URP publisher Bruce Walsh says that the chapter was discussed extensively among his editorial team. Although it’s a departure from the main narrative, the press intends to highlight its content in promoting the book to Canadian media. “We’re not going to run away from it,” says Walsh, adding that Jahanbegloo’s anger with Canada is intellectually justified. Typically, Jahanbegloo sees his reaction to this country in the context of a more philosophical, long-term self-examination. “I have an exilic mind and it’s difficult to have an exilic mind and live in Canada,” he says.